I'm a Britaholic black cat and, as soon as I've stepped in Ottawa, I've breathed a somehow familiar atmosphere. After all Ottawa is the capital of Canada, and I guess that Lizzie and her ancestors wanted it to feel like being at home. 1) streetlamps - which might be a small thing, but I think they are accessories which help to define the look of a city. 2) Parliament Hill - a beautiful neogothic assembly that really looks stolen from the Thames's Embankment. 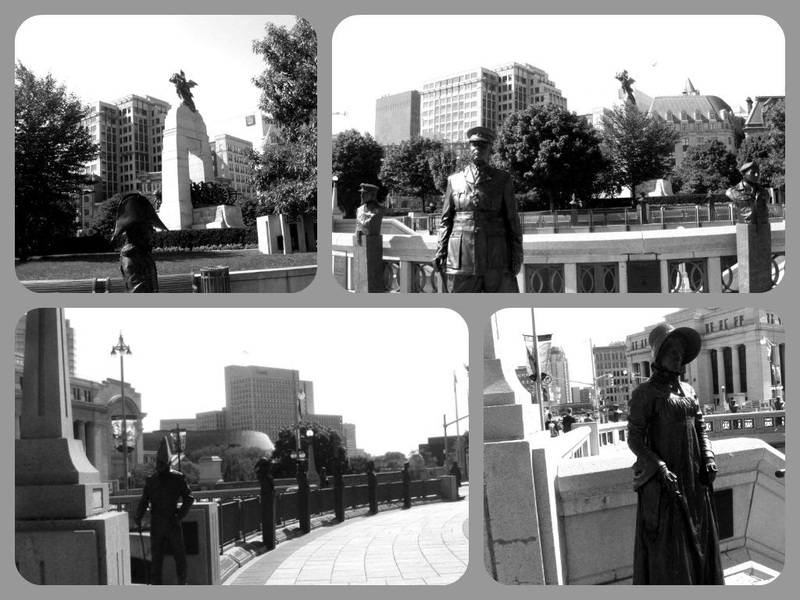 Besides taking a close look (which we are going to do a few lines below), I also suggest you to cross Alexandra Bridge and admire it from the other side of the Ottawa River, near the Canadian Museum of Civilization. It's a rather impressive view! 3) Change of the Guard -in front of the Parliament you can admire, every day at 11 am, you can witness a Change of Guard ceremony pretty much similar to the one at Buckingham Palace. Seeing the Queen's Guard parading, with their bearskins and red uniforms, and then the Scots Guard, with their bagpipes, has been ... touching. I am a sentimental cat, I know. But have I ever told you that the sound of bagpipes really makes me emotional? 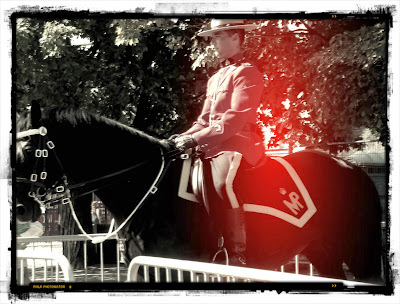 Well, but after having watched the Change of the Guard, please take a stroll around the Parliament Hill. By the way I've seen it both under the sun and under the rain, and I must admit it had its own charme in both situations. And at night, with all the games of lights all around, it's even more. The complex is composed by the Senate and Commons chambers, the Supreme Court, a block of offices, a library and a tall tower, called the Peace Tower that, with its 92 mt, is one of the tallest buildings in Ottawa. Skyline here has in fact been controlled with heigth restrictions in order to keep the tower visible from most parts of the city - which gives to the city a European appeal. 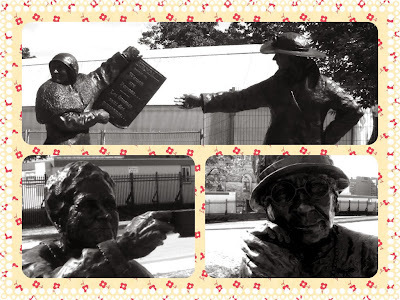 The Parliament is surrounded by quite many statues and monuments, but the one I've enjoyed the most has been the one to the Famous Five: they were a group of women who, in the 1920's, filed a petition for women's rights. 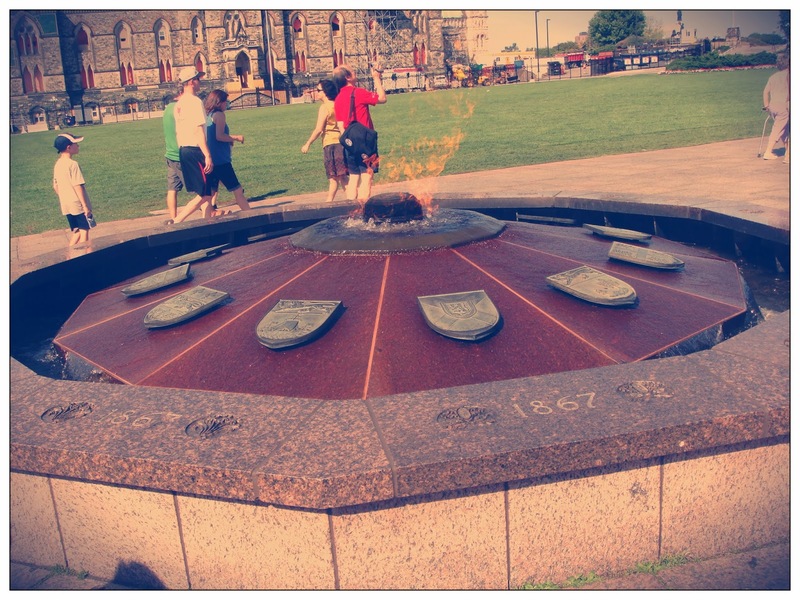 Then I've also like the Centennial Flame: this is a fountain that commemorates the 100th anniversary of Canada as a confederation. It has actually a quite simple shape, but I like the idea of putting together water and a everlasting flame - it's an interesting contrast and somehow symbolic. Oh, and besides the Queen's Guard I've also managed to spot one of the Red Serges! He was alone, as you can see more in Vancouver - but just to forget all my British hype and remind myself I'm in Canada, here he is. But the most exciting thing about this place is that I've met other cats! They are called the Parliamentary Cats and they are stray cats who live in the precint of the Parliament Hill. They even have their colony which is called Cat Sanctuary - which I find a good idea to remind humans that we cat are sacred. Actually until 1950's they used to work there, to catch the rodents. But then humans decided that chemistry could do that much better; so the cats could simply stay there as hosts, being fed and care-taken by some volunteers. But now I read that the colony has been closed in 2013 and the cats have been all adopted. Enough with the Parliament now! Ottawa also has other nice places which are worth a visit. For example take a stroll around Confederation Square, where you can admire the National War Memorial monument and the statues of the Valiants Memorial spread around. I've found it quite spectacular. 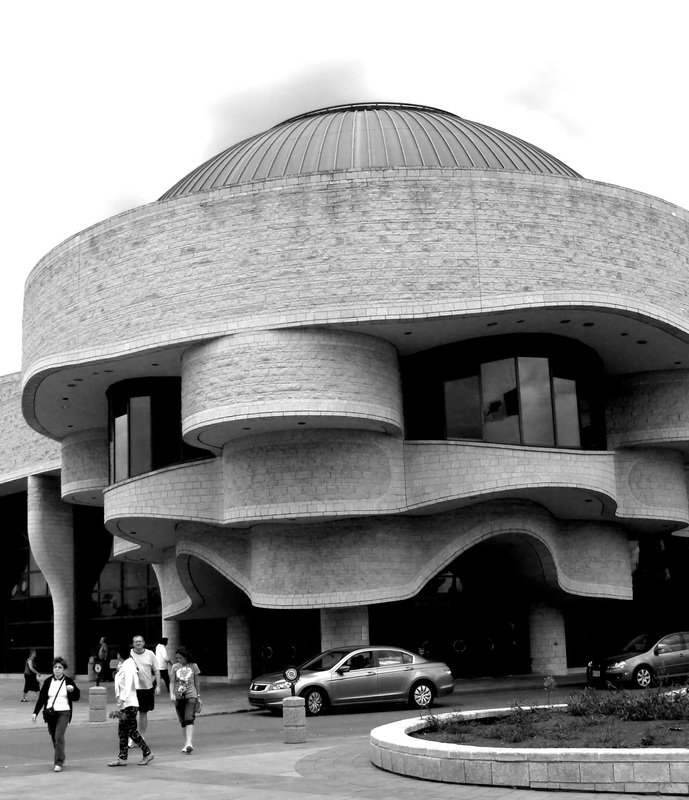 Canadian Museum of Civilization is rather interesting. Besides the contents, its peculiarity is that the main entrance looks like a human face. Plus, in the Grand Hall, you can walk around admiring both the exhibition and a beautiful sight of Ottawa river and Parliament Hill. A friend had suggested me to not miss Beaver's Tails while being here in Ottawa. No, well, don't worry - we cats are hunters, but personally I would never attack a beaver: they are big and have strong teeth. And actually these so called "tails" are just pastries, with fried dough and the shape of - that's it - the tail of a beaver, which can have any kind of topping you prefer (chocolate, fruit, cream, crumbled cookies, and so on). Anyway, I would have loved to taste them, but during my day in Ottawa weather was way too hot and I was too much in a hurry for my lunch, so I couldn't find the time to. But if you I'll be curious to know your opinion!